I know what you’re thinking? ANOTHER tomato soup recipe??? Yes. Another one. Do you have a problem with that? Just like this one was and this one. In fact, it’s a combination of the two and adds some pasta into the mix, as well. 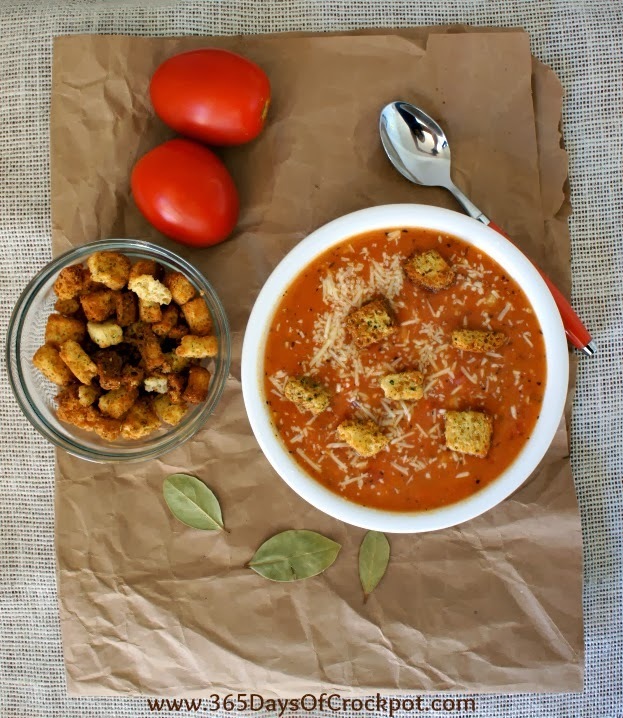 If you love creamy tomato soups, you’ll love this recipe! Click the picture to pin it! 1. Add carrots, celery, onion, tomato paste and oil to a microwave safe bowl. Cook in the microwave for about 5 minutes. Stir every 90 seconds. Transfer to a slow cooker. the flour into the vegetables (it will be pasty). in basil, oregano, tomatoes, water, bouillon, honey and salt. Whisk a bit, until flour and veggies are combined. Add in bay leaf and cover. Cook for about 6-8 hours on LOW, or until veggies are soft. parsley. Meanwhile, cook the pasta until al dente over the stove. Add the cooked pasta into the slow cooker. Salt and pepper to taste and add in additional basil and oregano, if needed. Ladle into bowls and top with additional Parmesan and croutons. This is a creamy tomato soup with texture and flavor! So amazing. 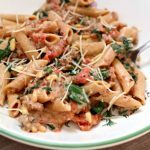 I loved adding in the pasta to make it a little more filling and more of an entire meal. 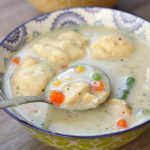 My whole family loved this soup. If you like a creamy texture, you can always use an immersion blender to blend the chunks of veggies. 5 stars. I think it would freeze okay. I'm not sure how the pasta would do though. I've never tried it so I'm just guessing though! Ha ha! Feed him this. He'll love it. I'm making the version from the cookbook. That recipe does not call for tomato paste. vegetable are added raw, not precooked. In addition, it calls for a roux 1 hr just before the end of cooking time. 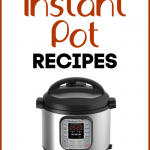 I'm halving the recipe and using a 2 Q Crock Pot. Used one 14.5 oz can of tomatoes and halved all other ingredients so far. Plan to puree it w/ my immersion blender…hoping for something that tastes like the Creamy Tomato Basil Soup at Panera. 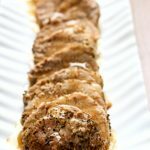 whenever I make this everyone in the family has me do a triple batch! 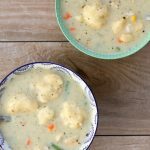 this soup is LOVED! Roxanne, Yum that sounds like a delicious breakfast! Is it a mix or a recipe that you make homemade? 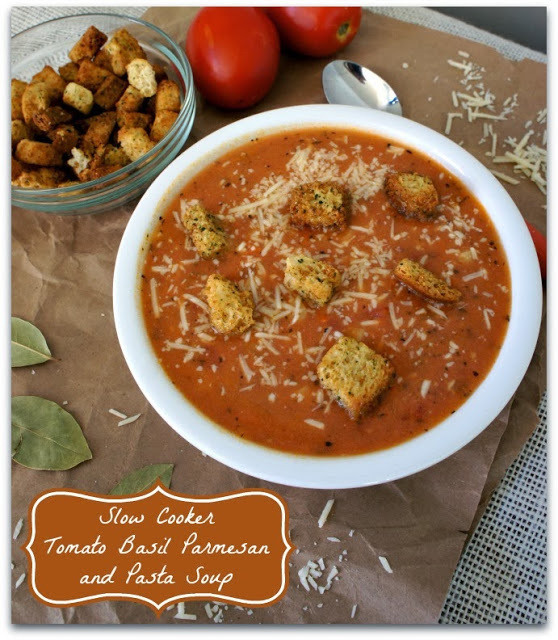 Tomato Basil Parmesan and Pasta soup…wow, does that look delicious! I just got my slow cooker about a week ago, so I'm still getting use to it. I really love it. As of now, I use it everyday for breakfast. I make nine-grain cereal overnight and my kids love it. You cook the soup on low for 4-6 hours…not stir it. It's in a slow cooker so it won't burn. Why do we stir the soup for 4-6 hours.won't it burn even on low flame.what is the purpose behind it. hooray! glad you liked it. I'm making this soup for the second time. 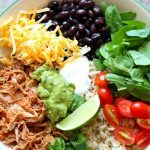 It's smelling yummy in the crock pot as I type this 🙂 It is incredible! Last time, we all had seconds, even my two year old. I'll be adding this to the recipe box for sure. This looks delish! One quick question though. 4-6 hours on low or high? I had some of this at my daughters today. I only took a little bit because I thought "what if I don't like it? How could I throw it away without her seeing?" NO worries!!! I had a bigger second bowl and wanted more but I was full. I pinned this as soon as I got home!!! I made this today and it was so delicious! It made a lot for our family of 3. I was thinking I should have canned some of it before I put the cream, cheese, and pasta in it. Don't you think that would work? Everyone liked this and had seconds! I didn't have any tomato paste, left out the pasta, and pureed it. YUM! Thanks for a keeper!